The Bermuda Arts Centre is getting set to host a Haunted History Bus Tour as a fundraiser, with part one of the event to explore the west end. A spokesperson said, “Have you ever wanted to know a little more of Bermuda’s haunts? Travel from Dockyard to Hamilton, with tales of the darker side. “The tour is full of short walks and stories. Take the 5.00pm ferry from Hamilton; the bus leaves Dockyard [outside of the Frog & Onion Pub] at 6.00pm, arriving in Hamilton at 8.30pm. Tickets cost $75 per person and include light snacks and pumpkin spice cocktails served at Gibbs Hill Lighthouse. Tickets can be purchased by emailing artcentre@logic.bm or calling 234-2809; there are only 24 seats available. So we aren’t gona mention how this is a rip off of the Haunted History Tour in St Georges??? Thankfully, they have agreed to change the name! I think there’s potential for more ghost and story telling tours in Bermuda, and I don’t have a copyright, but it would just get downright confusing for there to be two ghost tours of the same name. Especially after I’ve worked hard to build the brand. In response to Lexi, just about every city has a Haunted History or Ghost Tour. There is a Haunted Houses of Bermuda tour and book written. The tour in St. George’s that has been developed is great. But there is certainly room for more of this type of thing in Bermuda. Loved by tourists and locals. 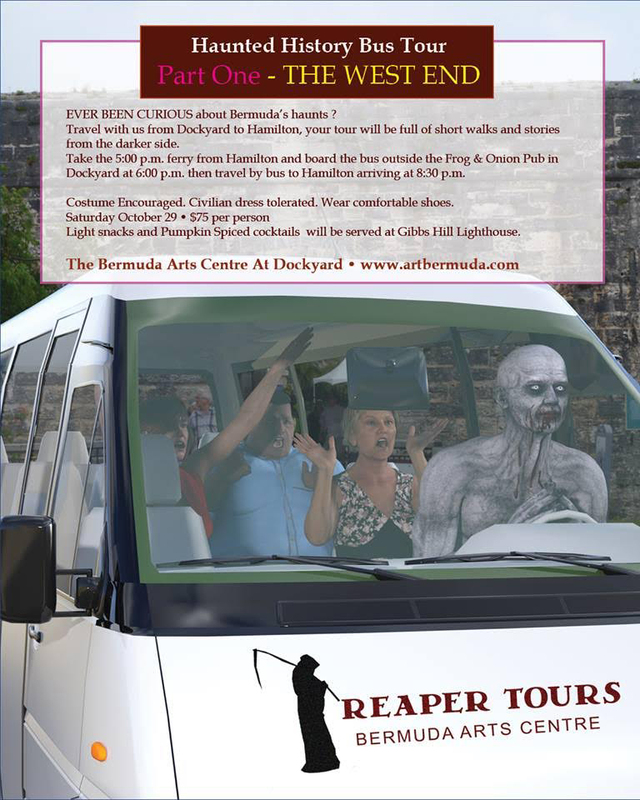 This is a one-day fundraiser for the Bermuda Art Centre at Dockyard and it’s instead of their annual Zombie Walk. This is only for Halloween. There are plenty of other more important things to complain about. Really. I welcome another ghost or haunted storytelling experience but I think Lexi’s point (as was mine) is that there was no reason to have the same name ‘Haunted History’. You can say that ‘there are more important things to complain about’ but as a small business that is working hard all year round to provide an interesting and cool activity, and create jobs for local actors – this was a very frustrating and distracting moment as I immediately had to begin fielding calls and social media tags.